Good Morning, I'm thrilled to learn about the Watch for Wildife program and inspired to support it. For too long, I think, folks assume that killing wildlife is collateral damage for anyone driving a car. I've been driving for most of my adult life and for many reasons, I've rarely struck an animal. I pray that I have the good fortune of maintaining that trend. I would like to make a donation and also get one of your stickers for my car..slowing down and watching carefully for animals near the roads is something I feel strongly about. I keep seeing info on this initiative - and it mentions a sticker for the car. How do I get one?? Thank you - not in a position to donate - but we are stewards of 26 plus acres of land that is left to the critters to live on. And our lovely dirt road is welcome to critter crossing! In early spring the Atlantic Wildlife Institute had the warning signs placed at the traffic circle notifying people to slow down. 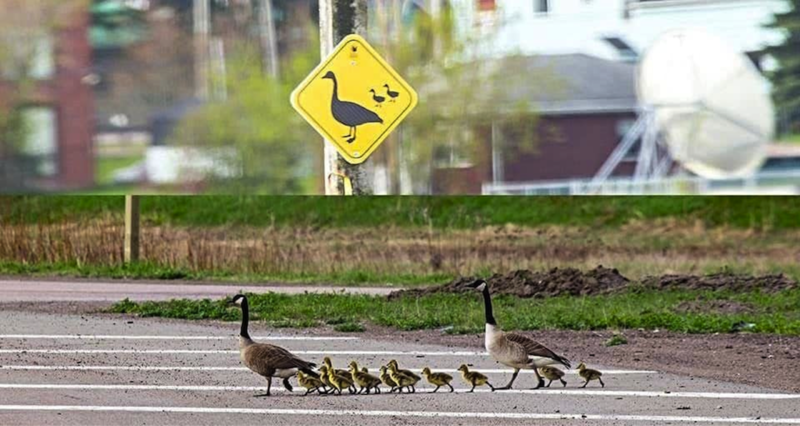 Because geese and their babies were being hit. After about four days the Department of Transportation removed the signs because they stated they hadn't approved the signs to be put up. Tourist time is soon approaching and travelers will not be aware of the geese in that area. The sooner the government looks into this and have the signs put back up the better. I am asking on behalf of myself and the many travelers of the highway to show compassion for the animals/geese of the area. Hi. I was driving along the 102 almost to Bayers lake and there were like a dozen of baby ducks on the road, some already dead. Everyone was slamming on their brakes but no one could move enough get out to help them without endangering yourself or others. It was devastating, I cried the rest of my way home. I never hit any, well only two were standing, as I slightly swerved. It was the worst sight I have ever seen. What can we do to stop this? So much roadkill. I wish either we had concrete barriers on both sides of the roads with underpasses, or we could have tunnels in the barriers now so they can maybe make it across the road. Nonetheless, it needs fixed. What can we do, how can we help?!!!! I would like to have the phone number(s) for reporting a collision I would like to keep it (them) into the glove compartment of my car. Read Zack Metcalfe story in the Halifax Herald and I live out in the country and dragged more dead deer off the road and my lawn than I can count. Talked to RCMP about speeding, I live in a 70 km zone, went to Natural Resources in Bible Hill and talked to foreman at DOT in Brookfield about signs, (and nothing) from all three parties. My wife and I LOVE the nature and wildlife at our place and woodlot and are so feed up with the non response. I made 2 signs with Caution Deer on them and put them on the sides of the road. Thank you and hope to hear from you as I can tell you more. How Can I Obtain a Bumper Magnet? Since I often drive down to the South shore, I am aware of the potential wildlife fatalities on the highways and byways. How can I obtain a bumper magnet for my car? (Mentioned in todays Chronicle Herald (D2). Thank you for all of your letters, your stories, and your support. Please keep them coming; and keep caring about wildlife in our midst, safety for yourself and others as you drive.